In Part 1 of our 4 Part Series on Bream, You read about The Best Places to Find Bream in Australia. In Part 2, You read about the Best Way to Catch Bream in Australian Estuaries, Bays and Harbours. 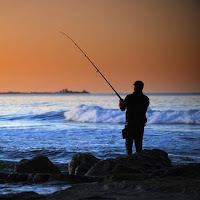 In this Part 3, read about the Best Bait and Rig for Surf and Rock Fishing For Australian Bream and About Fishing for Bream with Soft Plastics In Australia. 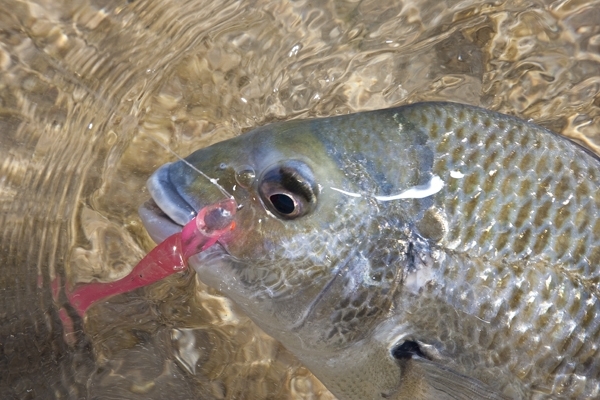 In New South Wales and southern Queensland many surf and rock fishermen target Eastern Black Bream. When fishing around a rocky bottom, the favourite haunt of bream, it still pays to use the sinker right on the hook to alleviate constant snagging. However, when fishing a sandy gutter try a 40 centimetre trace below the lead weight and a No1 or 1/0 hook. Rock and surf fisherman going after Bream will use a range of baits including yabbies, peeled prawns, marine worms, , mullet gut’ whole and cut pilchards, fish fillets, strips and cubes. In terms of soft plastics, my mate Garry says to try 2 and 3 inch shads for daylight Bream fishing. Apparently these are supposed to represent small bait fish but closely mimicking prawns in their action for daylight soft plastic Bream fishing. He also says to give the shrimp styles in 2 inch a try. As with most bream fishing getting your soft plastic or hardbody lure close in to the structure is the key to success. Types of retrieve also effect results and stop, wait and then short lift retrieves seem to work. We hear lots of people ask what is the best colour soft plastic lure for Bream. A lot of fishermen who use Soft Plastics to fish Bream swear by pumpkinseed or Motor oil coloured SP's. All we can recommend is that you try a few to find what work best for Bream in your favourite Bream fishing spots. Just like live baits, Bream can be fussy so be prepared to change if one style or colour is not working on a certain day. Be aware that because soft plastics are visual and work best for Bream in daylight or bright moonlit nights, so once its dark, we recommend that you switch back to live or fresh baits.